It’s getting increasingly difficult to ignore the abominable state of your home, not to mention the ever-mounting list of household chores. Unless you hire first-rate house cleaning services Brentwood soon, the situation will get out of hand. You have no idea how to have a clean home unless you fully apply yourself on daily basis, which is time-consuming and no fun at all. But that’s no reason to feel disheartened! What you need to do is be persistent and patient, focus and take pride in small victories. Enter our amazing tips and tricks to make upholstery look as good as new, with a world of difference between the current state of your upholstery and the end-result! Mix alcohol, vinegar and some lemon to make your own upholstery cleaner that you’ll keep close at hand. Sprinkle baking soda to get rid of unpleasant smells, let sit for 20 minutes and vacuum it up. Use paint to give your shabby furniture a fresh new look. Add details such as new cushions and you’re done! Whether you’re dealing with stains or not, regular vacuuming prevents the dust from settling into the fabric. If you’re diligent with this, you’ll never need deep cleaning. If you have pets, use a squeegee followed by vacuuming to get rid of pet hair stuck in the upholstery. How to have a clean home when your home’s a bottomless pit of housework? By calling MaidThis, of course! MaidThis is at your disposal to connect you with a professional maid who will go the extra mile for your benefit. 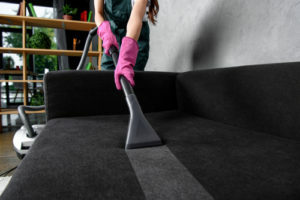 Our cleaning wiz will not only leave your home looking spotless, but also restore your furniture to its former glory. Never again will you wonder how to have a clean home – you’ll just call us right away and we’ll go out of our way to make you happy!